We are standing "A Dandy Rawhide" by Dun it Rawhide, 1995 NRHA Futurity Limited Open Champion, 1995 NRHA Futurity Open 3rd Place (tie), 1996 NRHA Superstakes Open Champion, 1996 NRHA Derby Finalist. By Hollywood Dunit, NRHA Hall of Fame; NRHA Open Derby Champion. The NRHA's only $4,000,000 Sire, NRHA #1 All Time Leading Sire, siring the earners of over $5,3000,000. A Dandy Rawhide is an AQHA Performance Champion. Open Superior Reining, with 52.5 points. Open Superior Dally Heading, Open Superior Dally Heeling with a combined 147.5 points. When Rawhide was a three year old, he won the Rocky Mountain Summer Slide Futurity Limited Open in Denver. He also qualified for and was shown at the World Show in Oklahoma as well as Congress in Ohio. Rawhide has since retired from competition and is one of the most well mannered studs we have ever been around. 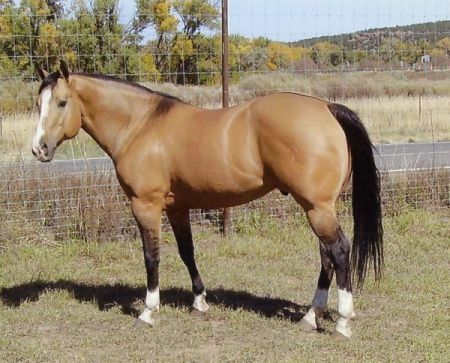 His colts all seem to take on this quiet personality, as well as the colors. They range from buckskin to duns to grullios. Our present broodmare band carries the bloodlines of "GenuineCredit" by Miss N Cash and "Zans Last Parr" by Zan Parr Bar. We also have mares from "Capital Letters" By Doc's J Jay, "Right On Tivio" by Poco Tivio and "A Night Train" by Great Pine. We are also featuring foals by Metallic Gun. Metallic Gun offers size (15 hands and 1/2 inch) and substance. 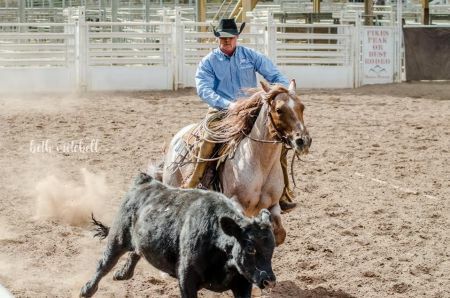 Impeccably bred, Metallic Gun was sired by Metallic Cat (NCHA Hall of Fame, NCHA Horse of the Year, NCHA Open Futurity Champion). Certain to be a sire of athleticism, cow and color. Metallic Gun received the 2016 Versatility Ranch Horse high Point award, AQHA Ranching Heritage Challenge. Metallic Gun took USRHC Open All-Around Champion Ranch Horse Champion honors in Las Cruces, NM.